South Korean air carrier Asiana Airlines has renovated a school in Uzbekistan capital Tashkent and supplied classroom equipment for local students, according to a firm Wednesday. It was part of the airline’s “Beautiful Classroom” project, a corporate outreach campaign the company began in 2012 to improve the educational environment for students in low-income villages. Since then, Asiana Airlines supplied 1.1 billion won ($990,000) in classroom equipment to over 30,000 students at 28 schools, according to the firm. This time, the airline donated to renovate classrooms and provided equipment like sewing machines so students could develop job skills in a more pleasant environment. 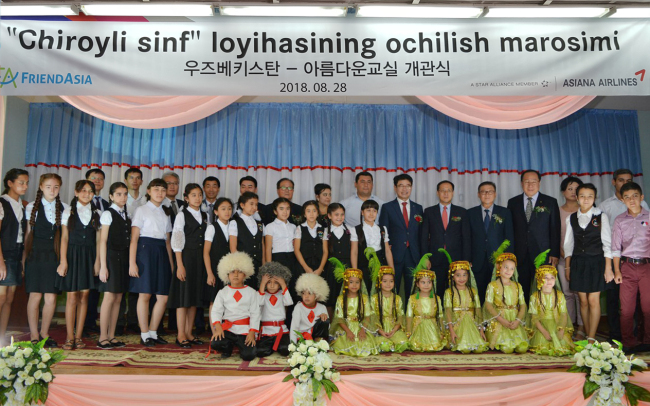 At Tuesday’s ceremony, attendees including Councilor Kim Jae-woo of the Korean Embassy in Uzbekistan and Asiana Airlines’ Managing Director Cho Young-Seok celebrated the reopening of the renovated school in Tashkent. “It is very meaningful for the company to conduct (outreach) activity in Uzbekistan where many Korean-Uzbekistanis reside. We will continue to support local students in this region,” said Cho in a statement. Tens of thousands of ethnic Koreans were relocated from the Russian Far East to Uzbekistan in the 1930s by the Soviet Union. A sizable Korean diaspora remains in Central Asia today.